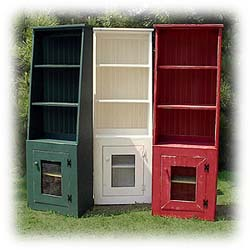 Organize your home with our knotty pine hutches and customized bookcases. Several of the pieces are modular and can be used in a variety of formations. All of our pieces are specially made with care at the time of your order. Choose from a wide range of sizes and colors to best fit your style and decor. All pieces ship within 1-2 weeks.